This week my baby turned 9 months old. It seems impossible that he's 3 months shy of a year! He came into this world 2 days late, even though I did everything possible to meet him sooner. From the first moment he has been the sweetest, happiest, calmest baby, the complete opposite of his big brother. At 4 1/2 months, he rolled from his back to his tummy. At 6 months he was able to sit up on his own unassisted. At 6 1/2 months he sat himself up. At 7 1/2 months he pulled himself up to a standing position. And at 8 months he was crawling. At the rate he's going, he'll be walking in no time. With all those milestones, he still has yet to grow a tooth! Ashton had his 9 month well check this week. He now tips the scales at a whopping 17 lbs, 14 oz, just a few ounces shy of 18 pounds, and rates in the 10th percentile for his age group. He is 29 inches long, which is the 75th percentile. My baby is long and lean. 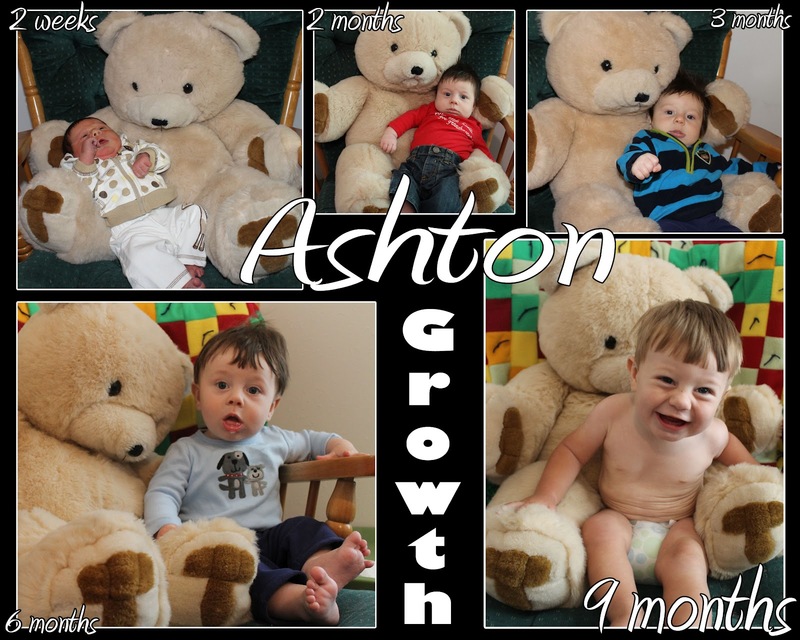 Here are his latest growth pictures, with a collage to show his growth over the past 9 months. Spencer and I had two very special dates this week. Monday night we went shopping at the dollar store to pick out party favors for his big birthday party coming up next weekend. It was an interesting shopping trip because my son somehow learned the phrase, "I want that!!!" I think he missed the point of the trip was to buy presents for his friends, not him. Afterwards we stopped for ice cream. Our second date was Wednesday morning. After dropping Ash off at Grandma's, we went to the theater for Spencer's very first movie experience. The Winona theater has $2 matinee Wednesdays, where they show older kids movies. The movie this week was Winnie the Pooh. He was barely heavy enough to hold the weight of the seat down, so his feet were slightly inclined. We each got our own box of popcorn, fruit snacks and an Icee. We munched and slurped away while watching Pooh try to find HUNNY. It was truly enjoyable watching Spencer experience his first movie. He giggled and talked out loud. Since the theater was pretty empty, with only a few other moviegoers, it was the perfect atmosphere for him. I'm excited for our next movie on what Spencer refers to as the HUGE TV! As soon as the movie was over, he said it was time to go see his brother. AWWWW! We also did some projects this week. The letter was Y, so we had some fun with yarn. Since our first project was messy, we went outside on Spencer's little picnic table to paint with yarn. We have painted with a lot of things now (apples, cotton balls, cars, feathers, pine cones, water balloons, etc.) and I'm surprised at how entertaining each new "paintbrush" is. The one constant when painting is how messy Spencer gets. This time was no different. He got paint all over his body, even in his hair. Since one of his new favorite colors is pink, he walked around with pink streaked hair all day. Once the yarn paintings were dry, I cut out upper and lower case Ys from one picture and made our Yy flashcard. We glued the colored yarn onto the second picture. For the next yarn project I punched some holes in a piece of card stock, tied a long piece of yarn on one of the holes, and then rolled some scotch tape on the end of the yarn to make it easier to weave it through the holes. Spencer had fun with this for about 10 seconds and then decided to pull it around the room instead. The last Y activity was to make our own yogurt melts. Spencer loves to steal the ones we buy for Ashton, so he was pretty thrilled to make his very own. I scooped yogurt into a plastic sandwich baggy, cut a hole in one of the corners and then we squeezed dots onto a pan lined with wax paper. We popped the pan into the freezer and waited. Once our yogurt melts were frozen, we sampled some. I am happy to report this cheap, easy and healthy snack went over well with my picky eater. Here are more random pictures from the week.